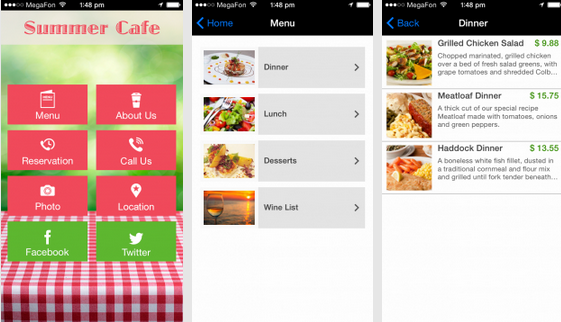 Are you in need of inspiration when design Mobile App Templates? I often feel that inspiration is a hoax, but rather you can find your muse by searching through creations that people before you have created. That’s what’s so wonderful about the mobile app market. You can literally open up your iPhone or Android phone and browse through over 1.5 million apps. These options have beautiful designs, interesting button placements and text that may get you thinking about how you can represent your company in the mobile world. You might be wondering: That’s all fine and dandy, but what happens when I get into the iBuildApp app maker interface? 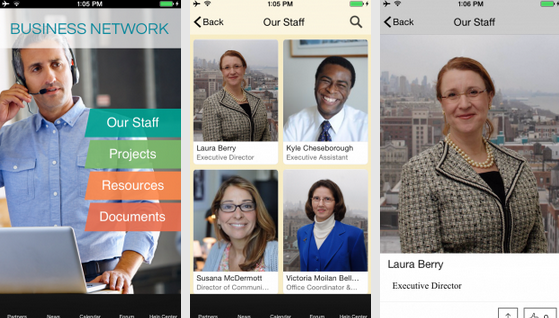 How is it possible for me to replicate a cool Mobile App Templates design I saw on my iPhone? We’re glad you asked, because many of the creations you’ve seen on your phone have been mimicked in the Template Store, allowing you to reach a level of professionalism that, at one point in time, only developers were able to achieve. As with all Mobile App Templates libraries, it’s fun to go through some of the new additions to strike up inspiration and show you what themes you can start with for your future app creations. So, without further ado…let’s look at the hottest new mobile app templates to get your business rolling. 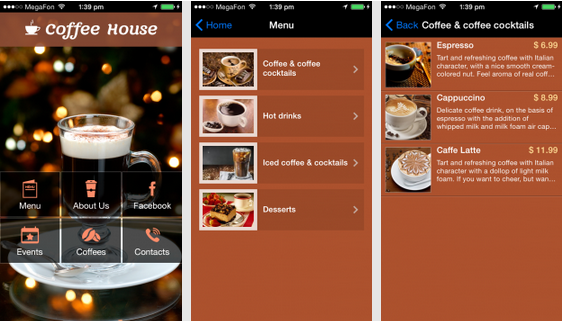 The Coffee House template is not a niche that’s new for iBuildApp, but this fresh design not only combines the brown colors of what you expect from a coffee house, but it incorporates modern imagery for convincing people to come into your shop. The homepage buttons blend in nicely, and it has built-in buttons and tabs for showcasing your coffee, sharing events and prompting people to call you in one click. The menus show up nicely, and you can even offer pricing before people walk into your store. The Business Network template works well for just about any business type, but it’s primarily designed for a company that is looking to showcase past projects. The first button sends potential clients to your staff page for some solid personalization, and the documents tab enables your organization to quickly send out documents if needed. 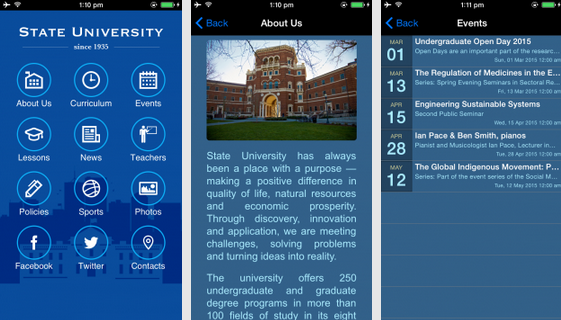 It’s not the first school theme from iBuildApp, but this one focuses directly on the college niche, with a fancy blue background that can be customized to your school’s colors. The curriculum section is ideal for connecting with students, and the events page keeps people updated about what to expect next from the school. 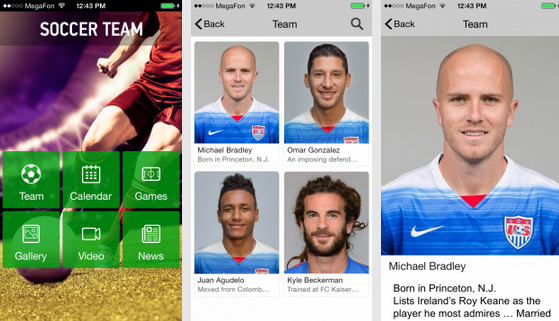 It doesn’t matter if you run a professional or kids soccer team, because this Soccer Team mobile app template empowers you to highlight the entire roster. Each player gets their own profile page, with large imagery and areas for talking about where they came from. In addition, you can update fans about upcoming games and include video from past matches. The Summer Cafe template provides a more feminine look for restaurants that have a casual atmosphere. The pink colors are great, but you can customize them if needed, while the menu page is organized into different areas like dinner, lunch and desserts. Offer pricing details for all of your food, and quickly setup a Reservation page so that you don’t have to worry about talking to customers on the phone when they want a table. Finally, a standout feature on the Summer Cafe template is the Location page, which shares a beautiful map for instantly navigating to your shop. Are you the owner of a pet hotel or veterinarian’s office? If so, this template has the features you need to contact your customers with push notifications, events and blog posts. 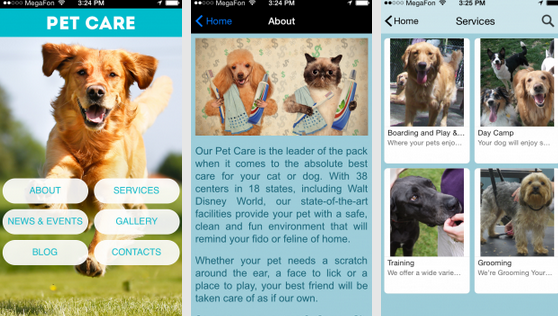 The most important area is called the Services page, where you can share what it is your pet company does, with cute pictures of cats and dogs, or whatever animals you take care of. Running your own radio station is tough these days, but the most effective way to reach out to listeners is through a mobile device. The Radio Station template has tools for posting your most recent shows, along with an online radio module for a live feed. Not to mention, the video page is great for giving an inside perspective on the radio station or for posting music videos. 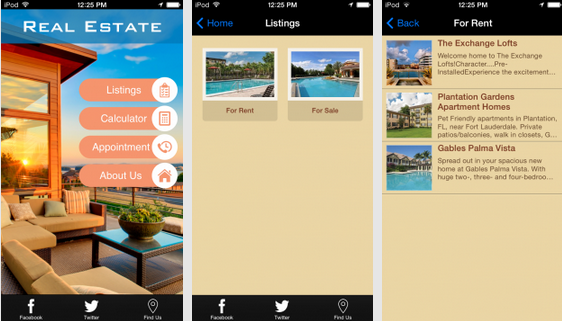 The Real Estate template offers a large homepage for uploading an image of a stunning house you’re trying to sell, and it also has a spot for showing off your listings. The Appointment page is a must-have, while the calculator is simply a way to make things easier for your clients. The iBuildApp Mobile App Templates library is filled with solutions, and we update the selection with new options quite a bit. If you have any requests for cool new templates, let us know in the comments section below.